You're in for an adventure if you dare to bike across Guyana. Tackling the 459 kilometer dirt track linking Georgetown to Lethem is sure to rank as one of your most memorable rides in South America. Guyana's still remote--now's the time to cycle this compact country with a Caribbean flair, before eco-tourism takes off and the inevitable tourist buses start flocking in. Guyana's coastal road, from Georgetown heading towards Suriname, is entirely paved and in good condition. This area is heavily settled and you'll pass one village after another. The Georgetown-Lethem road is unpaved except for the stretch between Georgetown and Linden which is paved and in good condition. If biking this route, be sure to stock up on provisions in either Georgetown or Lethem because there are few shops along the way and everything is more expensive. From Lethem you will be riding through savannah for about 130 kilometers until you reach the tropical forest and the Iwokrama rainforest. There are scattered villages in the savannah section, including a few ranches set not far from the road. Once you reach the forest (approximately 20 kilometers after Annai), the road narrows and there are no roadside settlements apart from the ones listed below. At Annai there are several eco-lodges, you can set up a tent at The Oasis where there is a spot to hang hammocks; showers are available and there are several small, but expensive shops in Annai. There is one more roadside shop and hammock hanging spot at the turnoff to Surama, 18 kilometers past Annai, just before the entry into the Iwokrama Rainforest. There is a checkpoint at the entry to the forest where you must stop and register. The forest road can be muddy and slick and is often quite hilly. There is a river crossing at Kurupukari. The pontoon is free and operates on the hour between 6AM and 6 PM. On the Lethem side of the river there is an Amerindian village set back from the road and another police checkpoint where you must register. There are several small restaurants with attached shops (expensive) and a guest house with hammock hanging area on the Georgetown side of the river. From here the hills continue on towards Mabura. Mabura is a saw-mill settlement. There are several restaurants and better-stocked shops with slightly more reasonable prices. There is also another police checkpoint where you must register. A further 20 kilometers is Mile 58, a collection of restaurants with attached small shops. This is a popular pit stop with good food. Again, there is a covered hammock area. Next is another long stretch of emptiness. The road is wider, and traffic picks up, but there are no settlements until you reach Linden and the paved road to Georgetown. Road conditions are variable. On some stretches the road is well-maintained and you can make good time. 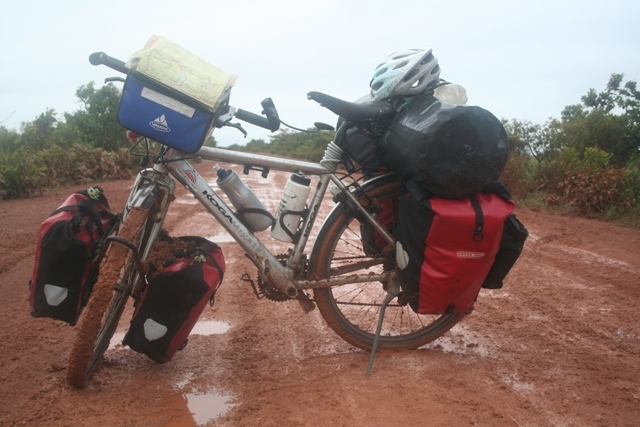 We biked the Lethem-Linden route at a particularly bad time--the start of the rainy season when many road sections had been recently covered with unpacked gravel. If you do run into trouble, there is enough traffic along the entire route that there's no need to worry about getting stuck--someone will stop to help you out. We were not able to get a Guyana map and relied on the map in our guidebook. Pitching a tent along the Lethem-Georgetown route could be tough in the rainy season when the area tends to flood. A hammock with mosquito net would be ideal. In the dry season you should be able to find a clearing in which to pitch your tent. There are plenty of streams along the route so getting water shouldn't be a problem. Just make sure you've got a filter or some other purification method. We were able to make it from one settlement to the next, thus avoiding jungle camping. Bike touring in Guyana will be expensive if you eat at roadside restaurants ($3 for rice and beans, $5 for chicken) or buy provisions in remote areas. But if you stock up in Lethem (where prices are low thanks to an influx of Chinese supermarkets) or Georgetown you can cut costs considerably. Chinese restaurants in Georgetown and along the coast offer cheap and filling meals--a large plate of veg fried rice goes for just $1.50. Hotels are also expensive (around $20 in Georgetown), so you might want to consider staying with Warm Showers hosts Joe and Christine in Temehri or Couchsurfing host Navin in Georgetown. Joe can also arrange for a place to camp in Lethem. Joe is a former bike racer and you will have a wonderful stay with him and his family. Guyana is yet another country with a bad reputation for crime. Fortunately, the situation has improved over the last few years and most of the serious stuff is concentrated in a few of Georgetown's toughest neighborhoods. Opinions differ on the safety situation on the Lethem-Georgetown route: some locals say highway bandits are no longer a problem, others insist taking the bus is the only way to make it through without being robbed. We did not feel unsafe at any point while biking in Guyana. There's just one ferry a day leaving for Suriname. Departure time is 11 AM, and you should arrive an hour in advance to purchase tickets and clear customs. Late arrivals are often turned away. The ferry costs $10, payable in Guyanese or USD. The ferry dock is along a rather poorly maintained road, another 12 kilometers from the final settlement of Springlands. Snacks are available at the dock and there are the usual money changers, but rates tend to be poor. Suriname immigration is disorganized and slow, so be fast when you get off the ferry and try to make it to the head of the line. On the Suriname side, there are just a few farms before you reach Nieuw-Nickerie, 38 kilometers from the border post. Any advice or questions about Biking in Guyana?